no show will be refund. Cancellation notice must be made at least 1 week in advance. Details must be discussed with hostel manager case by case, depending the size of group. Rent a whole house will have perfect privacy and room rate can be specially discounted for big group stay. This amazing newly refurbished Chinese character house is run by a nice local family in old Hutong neighborhood of central Beijing. It peacefully hides behind busy streets, not luxurious but more comfortable and relaxing, bright, clean and full of Beijing local taste. The guest house impresses with its beautiful garden courtyard, sunny and clean rooms, city center location and super convenient public ransportatiotns, considerable service and traveling arrangements, etc. Of course, warm English speaking staff is more essential. NB: dorm is only open to students and youth below 28 yrs old. 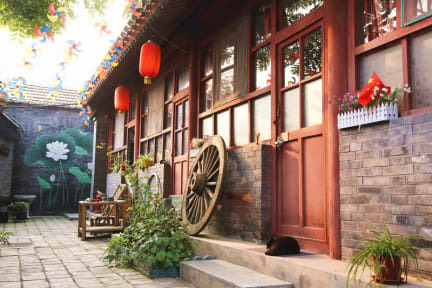 Living in this hostel can help you get a better understanding of Beijing local life. You could never get the same feeling and traveling experience from any other places. Temple side house gives you 'a glimpse of what life in the city is really like'. 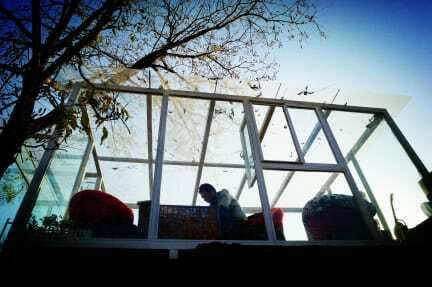 The Temple Side House Hostel has the superb location in the city center of Beijing. It is super close to metro station. There are two old Buddhist temples around the hostel, in only 3 minutes walking distance. Staff are super friendly. Nice location down an alley way. Close to sub way stations. A great hostel that gives you a nice view of China / Beijing. I'm sure it's not the last time I stayed there. It's clean, has a nice roof terrace and is really central. We loved this cute and quaint hostel. The residential neighborhood made it a nice and quiet place to stay. Rooms were nice and clean! Great outdoor sitting area on the roof and sweet puppies to play with! Very nice area, you really get a feel for the Hutong way of living. I loved the atmosphere, everyone were really nice, clean. I was however surprised there was no kitchen, or any place to prepare or store your own food. All other hostels I've ever stayed at has had that facility. I loved the placement of the hostel, which was right in the middle of a bustling hutong, and the staff at LianLian are also super friendly. However the dorm room was quite crammed and rather cold, and the only common area was outside or semi-outside, so I would not reccomend staying here in wintertime (as I did). I imagine the place being really nice in summer though. Very nice place to stay, the top deck with fairy lights provided a nice atmosphere at night. We stayed in a private twin room. Beds were very comfortable and amenities were decent. Could be closer to the centre. Closest subway is 20min walk and Hutong area 50min walk. Only issue we had was with the staff. Most of the staff were extremely friendly, although they did not have much English (which we didn't expect them to have). However, two of the staff members were very rude and very unhelpful. Had a good time here. Stayed in dorm which also had some staff. Mattress very thin as was common in China. Friendly staff. Good location as close to subway. Can walk to many places within 1 hr strolling radius. Went to the vegan/vegetarian night and got to meet owner. Very cool people to chat with. Atmosphere is nice for relaxing. Would recommend, however of looking for comfort stay at their other accommodation as it is worth the extra money. Saw this area and it is an oasis. READ THE FINE PRINT! We wanted to cancel our booking with them, and called three, four days ahead of time. It turns out, if you don't cancel your booking two weeks ahead of time, they will charge you for the booked stay in its entirety. Deposit and one or two nights I can understand, getting charged for five nights is pretty absurd. We arrived at the hostel, and when we nicely asked to cancel one night, the manager was very angry and screamed on us! It was very scary, and we just took our stuff and ran away. Don't go there.